According to the June 2015 revision of the Mid-and-Long-Term Roadmap, issued by the Agency for Natural Resources and Energy, of the Ministry of Economy, Trade and Industry (METI), efforts aimed at decommissioning the Fukushima Daiichi Nuclear Power Station, owned and operated by Tokyo Electric Power Company (TEPCO), are expected to continue for the next 30 to 40 years. One issue faced in planning specific steps to achieve this is how to ascertain the state of fuel debris within the reactors. Fuel debris is believed to be the result of reactor fuel melting in the reactor pressure vessel, the location of the reactor core. In this state, it penetrates the sides, and while fusing with exterior structures, drops into and spreads throughout the containment building in which the reactor pressure vessel resides. Decommissioning cannot proceed unless this debris is removed, but this requires precise information on its location and condition. The level of radioactivity inside is unsafe for humans, so robots have been sent in to investigate. Mounted on these robots are sensors equipped with a mini camera. 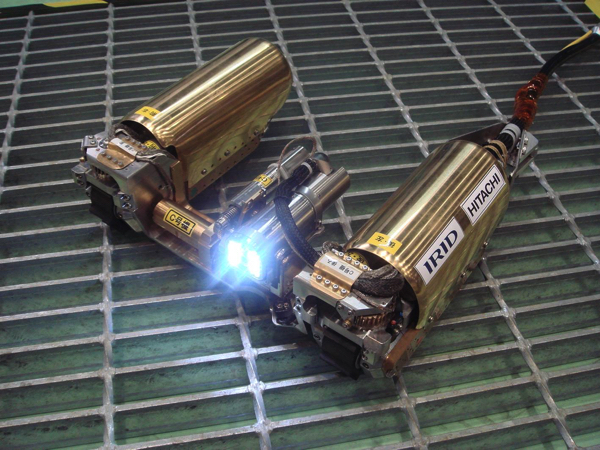 Hitachi-GE Nuclear Energy, Ltd. (Hitachi-GE), a member of the International Research Institute for Nuclear Decommissioning (IRID), developed a remote control robot for investigation. In April 2015, this robot went into Unit 1 PCV (Investigation B1). The data obtained was used to ascertain the current state of the PCV interior, making it possible to proceed to specific planning for the next investigation. Investigation B1 not only revealed the state of the PCV’s interior environment and structure, it also contributed to mapping out several routes for robots to take via the grating on the outside of the pedestal. The second investigation (Investigation B2) was given the objective of finding out if the fuel debris had overflowed onto the pedestal exterior. The “PMORPH” was developed for this investigation. The “PMORPH” can change its form. It takes a rod shape for passing through the pipe passageway into the PCV and changes into a squared off C shape for stable travel on the grating. The “PMORPH” has a sensor with a built-in camera, designed to withstand high radiation and immersion in water, that can be lowered through gaps in the grating. This, plus a built-in dosimeter, provides engineers with reliable information regarding the state of the fuel debris. * Developed as part of the works of the International Research Institute for Nuclear Decommissioning (IRID) with subsidies of decommissioning and contaminated water management funded by the Agency for Natural Resources and Energy. The Fukushima Daiichi D&D Engineering Company, an internal company of TEPCO, the owner of the Fukushima Daiichi Nuclear Power Station, is responsible for decommissioning of the Fukushima Daiichi Nuclear Power Station as provided in the Mid-and-Long-Term Roadmap. The research needed for this project is carried out by the International Research Institute for Nuclear Decommissioning (IRID). 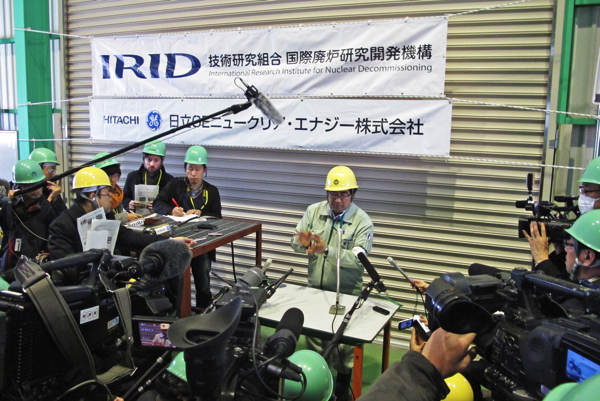 Established in 2013, IRID comprises 18 corporate bodies, including the Japan Atomic Energy Agency, the National Institute of Advanced Industrial Science and Technology, 12 power companies, and 4 plant manufacturers. As a participating member, Hitachi-GE Nuclear Energy, Ltd. (Hitachi-GE) is involved with research & development into spent fuel pool removal, fuel debris removal preparatory work, and the processing and disposal of radioactive waste. A part of this work involves the development of technology for investigating the PCV interior. Hitachi-GE's role is to create a means to investigate the exterior of the pedestal, which is the concrete structure supporting the reactor pressure vessel (RPV). Hitachi-GE developed a remote control robot for investigation and in April 2015 directed it into Unit 1 PCV. The PCV contains the RPV at its center, which is supported by a pedestal. The pedestal has grating around its circumference for personnel to walk on during regular inspections. In this first investigation (Investigation B1), two robots were released onto this grating. The first got caught in the gaps in the grating and became immobile. The camera on the second, provided to check the work environment, partially lost its field of vision due to the radiation. Both were left in place and never retrieved. Nevertheless, various types of data useful for learning about the interior condition of the PCV were obtained, enabling engineers to go forward with specific planning for the next investigation. Investigation B1 not only revealed the state of the primary containment vessel (PCV) interior environment and structure, it also let engineers map out travel routes for robots on the grating installed around the pedestal. According to Satoshi Okada, Ph. D., Senior engineer of Hitachi-GE's Nuclear Equipment Design Dept., Investigation B1 secured valuable information for taking the investigation forward. "Fuel debris has likely spread throughout the bottom of the PCV interior, so we have pooled water over that area to maintain stable cooling. Investigations so far have also told us that there is sediment in this water. Although we considered robotic travel underwater, we came to the conclusion that such a method was too risky in terms of travel problems and stirring up the sediment." The bottom of the pedestal features a personnel access port. The second investigation (Investigation B2) was purposed to find out whether fuel debris had overflowed out of this port. This information is crucial to deciding how to proceed with the work process. If the fuel debris leak is large, its removal must come first. If not, then priority is on the removal of the interior fuel debris. Okada added that "No one has seen the inside, so first we will go in to investigate the situation. Even bit of information will help bring our next step into view. We needed to consider a robot that could replace humans when going inside to carry out the investigation. "PMORPH", the robot for conducting Investigation B2, came about through substantial trial & error by our many engineers and the development team." The name "PMORPH" was created from the first letter of "primary containment vessel" and from "metamorphosis," the process by which insects change their form. This name was chosen for the robot's ability to change from a rod shape for passing through the access pipe to the containment building interior into a C shape for stable travel on top of the grating. After changing shape during the investigation, the robot will travel halfway around on the pedestal grating until reaching the top of the pedestal's access port. Here, the water to the PCV floor is 3.5 meters deep. To check for the presence of fuel debris under the water, the "PMORPH" is equipped with a suspended sensor. This system is capable of lowering a camera-equipped sensor, 20 millimeters in diameter and 40 millimeters in length and capable of tolerating strong radiation and water immersion, a maximum of 3.5meters through spaces in the grating. The sensor also has a built-in dosimeter for measuring radiation. By taking measurements at different locations and heights, engineers can put together a three-dimensional profile of the dosage rate inside the space. In this way, the "PMORPH" combines visualization and measurement functionality to provide a reliable understanding of fuel debris condition. To be ready for various possible circumstances at the investigation site, engineers carried out a series of operational tests using a full-scale simulation of Unit 1 PCV. Okada states, "Ideally, we want to achieve 100% of our objective, but we can't be sure what will happen at the investigation site. Even small increments of new information will get us that much closer to decommissioning. To this end, while wracking our brains and butting up against frustrating technical difficulties, we tested sending in the robot under the best conditions possible over and over again. Once we know the extent of the spread of fuel debris, we need to find out its characteristics, the structural state, and other information so we can start removal work as soon as possible. We still have much to do before we can begin decommissioning." The evolution of the "PMORPH" with the performance required for such investigations continues. We will report on the results of the Investigation B2, carried out from March 18 to the 22, 2017, along with further the "PMORPH" development, in our next interview article with Senior Engineer Satoshi Okada, Ph. 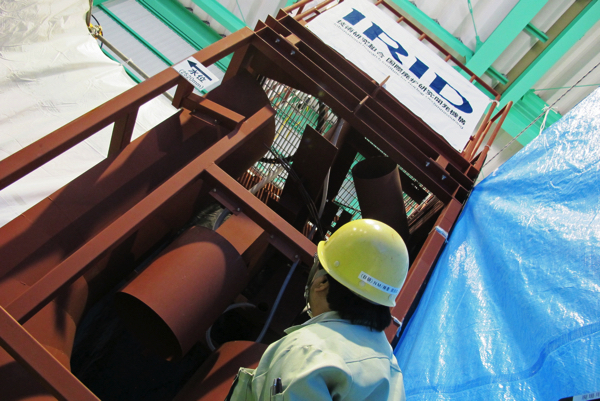 D.
Note: IRID’s "PMORPH" development has been made possible as part of the works of the IRID with subsidies of decommissioning and contaminated water management funded by the Agency for Natural Resources and Energy. Motivated by the need to know: “PMORPH” is a robot tasked with obtaining information about a nuclear reactor's primary containment vessel (PCV) as needed for decommissioning.